Life Kitchen is a cookery initiative set up to help people living with cancer and those caring for them. It offers relaxed, friendly cookery classes tailored particularly to the needs of people who have received chemotherapy. February sees the launch of its 2018 programme, with the debut sessions taking place at River Cottage HQ. 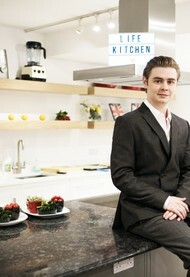 Food writer and stylist Ryan Riley founded Life Kitchen last year, in memory of his mother Krista. Since then, he has been developing recipes and working with cookery schools across the UK in preparation for the first classes. These take place at River Cottage HQ, on the Devon/Dorset border, on Tuesday 13th February. There will be two sessions, 10am-12.30pm and 2pm-4.30pm. Each session will have 20 places, to be allocated to ten people who are living with cancer plus a family member, friend or carer accompanying them. Tickets for the classes are free of charge and available on first-come, first-served basis. Sue Perkins, the TV presenter and foodie favourite will co-host the debut Life Kitchen classes with Ryan Riley at River Cottage HQ. “Our collaboration with River Cottage is a really exciting opportunity to work with some of the best cooks in the business and bring my idea to life. I’m very grateful for their support – which they have given since the very beginning of Life Kitchen - and I’m excited to get to work on the first classes”. River Cottage HQ is a multi-award winning cookery school set against the stunning rural backdrop of the Devon countryside, and just a stone’s throw from the Jurassic Coast. It covers 100 acres of organic farmland and encompasses a thriving kitchen garden and smallholding. The venue, established in 2007, is renowned for its keen sense of seasonality and sustainability and prides itself on championing the best local producers: it’s a foodie hub where you can learn, cook, eat and be inspired. 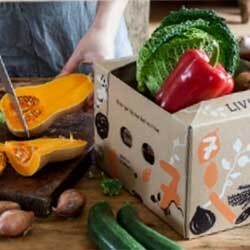 Huge thanks to our friends at Riverford who are supplying us with their delicious organic meat and veg for the course.